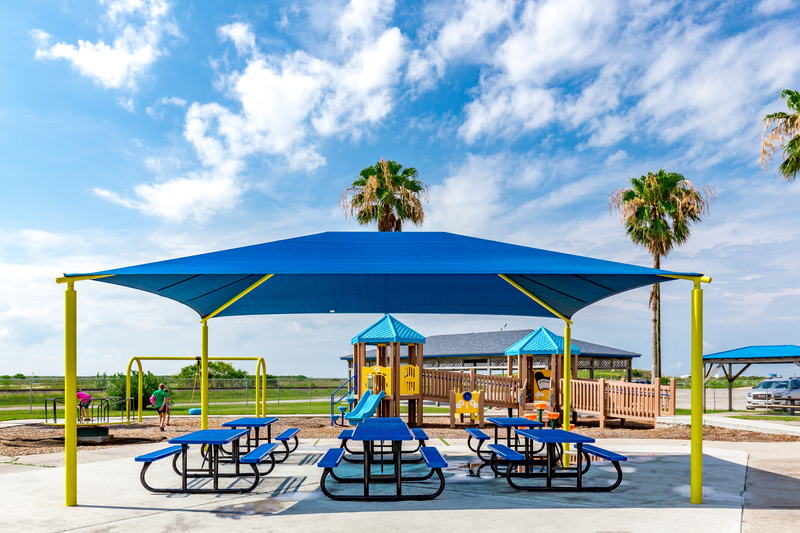 Many consumers think about shade structures during the hottest months of the year. But even when the temperatures cool off, one of these structures can increase your comfort outdoors. There are many benefits to having shade structures, such as relief from the wind, dust, the sun, rain, snow, and noise. Throughout fall and winter, there are plenty of advantages you can enjoy beneath the protection of a shade canopy. Shelter from The Sun and The Wind. It's not necessary to change the entire landscape or exterior of your facility to enjoy more time outdoors. A simple hip structure can be erected anywhere on your property to provide a sheltered area for students, employees, or the community to enjoy. With sun protection from harmful UV rays on everyone's mind, creating a shady place to relax will be appreciated. Precipitation Protection. Spend more time outside without being subjected to rain, sleet, or snow. An umbrella structure can provide you with shelter from precipitation whether you want to offer cover for two people or 10. Today's umbrella structures are attractive as well as functional and can add practical and aesthetic value to your property. Keep the Dust at Bay. As wonderful as it is to live in a rural area where you can enjoy nature, you may also be more likely to deal with dust on a regular basis. This doesn't have to prevent you from sitting outdoors because you don't want to deal with dust. Protect your sitting area with the type of structure that would best suit your home or business. A Protective Barrier from Noise. Enjoy versatile coverage and the added bonus of a noise buffer with a cantilever structure. Cantilever shades are best for protecting vehicles, providing sheltered seating, or as an extension of your living space. Extend the length of time you can spend outdoors by adding a shade structure to your facility. The ideal shade canopy for you will depend on what you would like to shade and your spaces' limitations. A professional can help you determine which structure will meet your needs and provide you with the enjoyment you seek.